Rendering of the Pullman recreational facility to open in 2015. 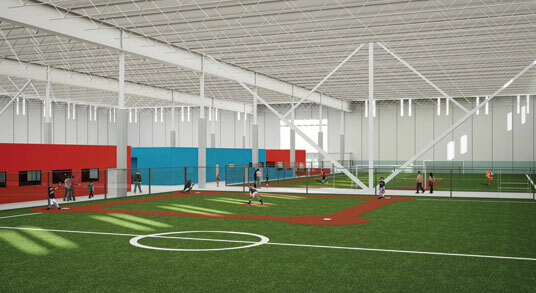 Groundbreaking for an indoor sports facility in Chicago’s Pullman neighborhood will take place on Saturday. The vacant site, at 104th and Woodlawn, once was an auto auction site. The Pullman Community Center will be 135,000 sq. ft. with artificial turf for baseball, soccer and even lacrosse and rugby. It’s on the campus of Pullman Park, off of the Bishop Ford Highway, a mixed-use economic redevelopment project designed to revitalize the area. Pullman has a 21 percent unemployment rate. About the same percentage live below the poverty level. The per capita income is $19,000. During the planning process, residents requested shopping and jobs for the area. Wal-Mart is now a tenant and a green cleaning company is opening its first U.S. manufacturing plant. “The third was the need for indoor recreational space. The feeling was there was really good outdoor park facilities but there wasn’t indoor facilities for families and youth to enjoy when it’s cold,” said David Doig, president of the nonprofit Chicago Neighborhood Initiatives. CNI will own the $15 million sports center, which is scheduled to open in fall 2015 and target youth. The facility will will partner with the Roseland Youth Center and anticipates 1,200 people will use it every week. At night there will be adult sports leagues. Ninth Ward Ald. Anthony Beale said the facility will be a gamechanger for the neighborhood.